What is Custom Olm Minigame you may ask? Olm minigame is a new minigame with a custom made map and custom made new npc, with some brand new rewards to get from the chest at the end of the game, the minigame has 3 room you have to complete to get to the end where you can open the chest and claim your reward. How does olm minigame work:? In the first room, you will have to kill the Infernal Wizard, which have 4000 hp you need to kill it until you get First Room Key. 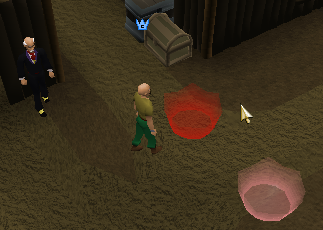 the drop rate is 1/400 but its all up to rng, when you get the key drop you click open gate and get to the next room. If you have Deluxe rank you can skip room 1 and go to room 2. In room 2 you need to kill Custom Olm Minion which have 7000 hp, you need to get 4 keys to get to the last room 3. When you have the 4 keys you enter the portal. This is the last and final room with the Custom Olm NPC, you now need to kill 99 Custom Olm witch have 2000 hp after you have killed 99 Custom Olm you will get the Final Room Key, and can now open the reward chest after you open the chest you will be teleported back to room 1. If you are uber or deluxe rank you have a chance not to be teleported back to room 1.